Greatings from one book lover to another! Welcome! 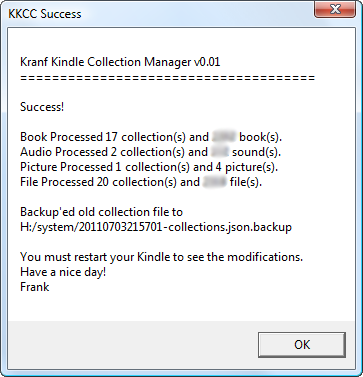 The Kranf Kindle Collection Manager (or KKCM in short) synchronizes your windows directories with your kindle collections. For each subdirectory inside your "document" directory (where all your books on the kindle are stored), you will obtain a different kindle collection (that has the same name as the subdirectory name). KKCM also handles & synchronizes your audio book collections (that are in the directory "audible" of your kindle). How to use KKCM - the Kranf Kindle Collection Manager? To know how to use KKCM, look at the Youtube video on the right! Plug your Kindle into your PC using the USB cable and wait until MSWindows recognizes the Kindle. 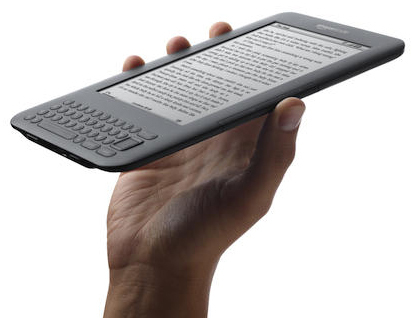 Let's assume that the Kindle is recognized as the G: drive. Using the Windows file explorer, navigate to the "G:\documents" directory on your kindle. At the beginning, all the books in your Kindle are scrambled together inside this “document” directory. Skip this step if no collections are currently defined on your Kindle. Run the "KKCM_collections2Dir.exe" application (double-click it). This will create, for each of your kindle collection, one subdirectory inside the "G:\documents" folder. Usually, this step is useful only the first time you use KKCM because, the next time you are managing your collections, all the books will already be in the right directories (unless you manually modified some of your collections using the cumbersome Kindle interface). This step will also detect the few books that are not properly handled by KKCM. KKCM will tag these "nasty books" as "untouchable". From now on, KKCM will never change the collections of these "untouchable books" (...but you can still use the Kindle interface to assign these books to the desired collections). In this way, ALL your books (even the "nasty ones") are easily assigned to the right collections. 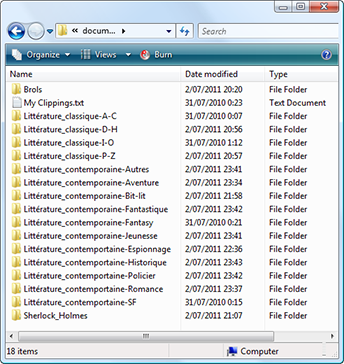 Optional: The software MobiHandler (from Alissa) allows you to see the picture cover, the author and the title of all your books directly inside the Windows File Explorer. For your conveniance, a copy of MobyHandler is bundled with KKCM. Run the "KKCM_dir2Collections.exe" application (double-click it). This will create one kindle collection for each subdirectory inside the "G:\documents" folder (and inside the "G:\audible" folder). Use the "Restart command" from the Settings menu: (This is the new, recommended procedure!) Unplug the USB clable, Press the "home" button, Press the "Menu" button, Select the "Settings" option, Press the "Menu" button, Select the "Restart" option. This restart-method preserves the date&time of the Kindle. Using the power switch: Unplug the USB clable, slide and hold the power switch (see illustration on the right, above) for about 15 seconds. After about 5 seconds, it looks exactly like the kindle has powered off but you still have to hold the power switch a little bit longer. This restart-method resets the date&time of the Kindle and is thus no longer advised (because it makes the “Most Recent First” list useless). The first re-start is quite long. Be patient! Why did I create this tool? I read a lot. Especially SF novels. During the winter, in the evenings, I used to read on my smartphone using the excellent Moon+ Reader for Android Phones. ...but summer is arriving fast and I noticed that it's nearly impossible to read on my smart phone in plain sunlight . ...so I tested a Kindle 3 device. I was pleasantly surprised by the Kindle 3 screen because it's really enjoyable to use it to read books in the garden! Reading at the beach is finally possible with an electronic device! Yeah! So I uploaded on my Kindle a fair amount of books (...just in case I am stuck, alone, on a desert island for 5 years ). ...and then, I realized that it's nearly impossible, using the Kindle interface, to correctly manage the many books on the device ? Although there exists a "collection" system to re-group the books together, this system becomes slower and slower as the number of books on your Kindle grows. When you have many books (more than 100), it becomes so slow that it's totally un-usable . The main difficulty, when using the original Kindle collection manager interface, originates from the fact that there exists no fast and easy way to assign a book to a "collection". Search for the drive letter assigned to the kindle (it searches for the drive that contains the "/system/collections.json" file). Backup the old "/system/collections.json" (so that you can always "void" all the changes made). The backup files are stored inside the "/system/" directory of your kindle. The backup filename is based on the current date&time. Creates from scratch a new "/system/collections.json" based on the sub-directories observed inside the "/document" and "/audible" directories on the kindle (it's this step that actually really changes all the "collections" of the Kindle). So, what's so special about KKCM compared to other Kindle-Collection-Manager-tool? It works! All the time! All other tools have flaws. Before creating KKCM, I attempted to use the tool from Collegate. After running the Collegate tool, there were 350 books not assigned to any collection and "left" in the "Home" of the Kindle (this is 35 pages!). I tried for 2 hours to correct the errors made by the Collegate tool and I finished building this tool (My "home" has now 2 pages !). In fact, the other Kindle managers were working properly with OLD Kindles. ...But the NEW Kindles have a different firmware (firmware v3.0.2 and above - since august 2010) that prevents these old tools to work any longer. For example, the Colegate Manager, the Calibre plugins, Kindelabra are not working properly (some books are not properly assigned to collections). KKCM is the only Kindle collection manager supporting all the Kindle releases/firmwares. I am a french speaking person that prefers to see Littérature rather that Litterature. This is even more important for people reading in cyrillic and greek. i.e. the few books that are not properly handled by KKCM. It might be caused by the Kindle hardware limitations because the refresh rate of the Kindle screen is rather low. I don't know exactly why it becomes so slow?! Anyway, I personnaly think that, even for managing a small number of books, the original Kindle manager is too cumbersome. I even recently discovered that I prefer to read on the Kindle than on paper! Going back to "paper" books, I noticed the rather "sloppy" printing of my paper books (most of them are cheap "pocket" editions): No two letters were printed in exactly the same way! In opposition, on the Kindle, the "printing" is perfect: All characters are finely drawn on the page. Because of that, reading on the Kindle is more relaxing than reading on paper (I need less concentration). After reading on a Kindle, going back to "paper" books is a little bit like going back to low resolution VHS tapes after watching high definition DVD movies! It handles your books but also your audio files! It's small (it's less than 1 MB!). Everything required to run the tool is inside the ZIP file. No need to install any cumbersome Python or Java virtual machine,... that are polluting your OS. You can thus copy KKCM on your internal Kindle memory to always have it with you. It runs on all Windows OS (XP,Vista,Win7,...). There are no dependencies on applications installed on the OS (no external tools or libraries are needed). Simply double-click the "KKCM_dir2Collections.exe" file and it runs, all the time. You can run it directly from the Kindle drive because KKCM is a "portable app": There are no modification to your OS. No bloatware installed. Personnaly, I placed the KKCM tool inside the Kindle drive so that I always have it with me when I need to updates my collections. It works without any internet connection, entirely locally. You can create new collections even when the Kindle is not registred or with a jail-breaked kindle. It's fast. You can process 2000 books in less than a minute. There is a free version! New engine introduced in version v0.11 (June 4,2012). This new engine is a *lot* faster and even more robust than before! Supported BOOK file types: mobi, prc, azw, tpz, asw, asw2, azw1, azw3, pdf, txt, zip, cbz. Supported AUDIO file types: aax, aa, mp3. Possibility to Assign the same book to different Kindle collections and to Ignore specific collections. With the FREE version of KKCM you can assign one particular book to only one Kindle Collection. It's very common to have a collection named "Current" that contains all the books that your are currently reading. The books inside the "Current" collection are usually also included into another collection, (the name of this other collection is typically based on style of the book: Thriller, Magazine, SF, etc.). The books inside the "Current" collection won't be handled properly by the FREE version of KKCM because they are currently assigned to several Kindle collections (KKCM will randomly assign these books to either the "current" collection OR to the other collection they belongs to). How to solve this? Simply includes a ':' character inside the collections that you don't want to manage with KKCM. KKCM won't create any directory for a collection that has a ':' character inside its title. For example, your "Current" collection should be renamed (using your Kindle) "Current:". KKCM won't create any directory for the "Current:" collection. 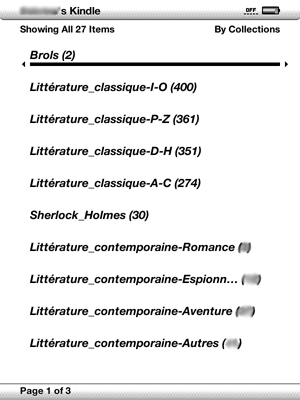 To summarize: if a book is included into 2 collections "A" and "B", then one of the two collections must be renamed to include a ':' character (e.g. "B:"). All the books that are inside the Kindle-collection named "Magazines>National Geographic" will be placed inside the directory "G:\documents\Magazines\National Geographic" (where "G:" is the drive letter assigned to the Kindle). Similarly, all the books inside the directory "G:\documents\Magazines\National Geographic" will be placed inside the Kindle Collection "Magazines>National Geographic". Why? This is handy when you have all your books inside a set of directories in your main hard drive on your laptop. You can simply & rapidly copy/paste these "blocks" of directories to your kindle and find all your books properly classified on collections inside your kindle. This is also handy when you are using Calibre because Calibre stores all the managed books inside a "nice" directory structure (based on author's names) that you can directly exploit using KKCM to create "nice" collection names. The user-parameter-file allows you to change the ':' and the '>' characters to something else. It also allows you to change the number of backup files (*.collections.json.backup) that you want to keep. The KKCM+ user-parameter-file also defines a small prefix (by default: the "_" character) that wil be added to all the collection's names. This is a request from one of the KKCM user. This user is displaying all its book in alphabetical order and wanted all the collections to appear first (therefore, we used the "_" prefix). You can also define a different prefix for AUDIO collections. When re-generating some new collections from directories, KKCM will keep the order in which the collections were displayed in the kindle (usually "last collections read" first). What will I do with the money? I will buy a small Mac to create a Mac-version of KKCM ! The price of the PLUS version is 5 €. If you like KKCM, you can create an URL-Link towards this page from your website (use this URL: http://www.applied-mathematics.net/tools/kindleCollectionManager.html). If you want to help other people use their Kindle in a smarter, funnier way, you can increase the visibility of this tool by adding a URL-link toward this page (so that its google-ranking increases !). If you like this tool, please add a message in the guestbook ! Connect your kindle to your computer via a USB cable. Click on “My computer” and identify the Kindle as a removable device on your computer. Open the Kindle drive. You should see the "documents", "audible", "music" folders. Create some sub-folders inside this “Picture” folder, one for each group of pictures that you will upload on your kindle. Only the subfolder names will appear inside the Kindle "Home" screen (and not the picture filename). Go to your Kindle "Home" screen, press and hold ALT + Z until the Kindle recognizes the sub-folder that you created as a book and it appears on the screen. Use the select key to open and view the photos. Root your device and open a shell. For K3 users: edit the text file "/opt/amazon/ebook/bin/start.sh". For K4 users: edit the text file "/etc/upstart/framework". Search in the text the string "-DENABLE_SEARCH_INDEXING_THREAD=true" and replace it with "-DENABLE_SEARCH_INDEXING_THREAD=false". Bonus: MobiHandler (from Alissa) allows you to see the picture cover, the author and the title of all your books directly inside the Windows File Explorer. Bonus: A free Kindle book that summarizes all the documented and undocumented keyboard shortcuts for your kindle (only 3 pages). This makes a good, short reference book. You can see the content of this book here. Bonus: A website explaining how to change the Kindle 3 screensaver images and how to change the Kindle 3 fonts (Even correctly documented, these are dangerous procedures because there is always a risk of destroying your Kindle). There is a new procedure to change without any risk the Kindle 3 fonts. Bonus: For American users: you can download 2 totally free games for your Kindle (with free wireless delivery): Every Word and Shuffled Row. Bonus: Super watertight bags that are quite cool to read in the bathroom with your Kindle. I hope you enjoy KKCM and the bonuses!